Called “groundbreaking” and “well written, organized and presented” by Midwest Book Review, Pamela N. Danziger’s latest book, Meet the HENRYs: The Millennials that Matter Most for Luxury Brands, is about the next-generation consumers that every brand manager, marketer and retail executive needs to know and know well – millennial High-Earners-Not-Rich-Yet consumers. 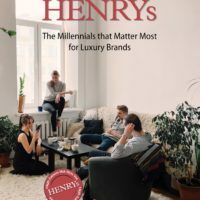 This forward-looking book examines trends and profiles 25 emerging disruptive brands that millennial HENRYs are drawn to. As a researcher focused on retail and a Forbes.com contributor, she explains how many of these innovative brands are setting themselves apart from the traditional top-tier brands. HENRYs hold the purse strings to luxury brands’ future. As a subset of the largest generation of Americans, mass-affluent HENRYs earn between $100K and $250K–the income cohort that accounts for 40 percent of all household spending. As a result, they are critical for brands as diverse as Walmart and Gucci. The reality of the current consumer economy is that the American middle class has lost much of its spending power, leaving brands that have traditionally targeted this customer – Macy’s, JC Penney, Gap, Target and Kohl’s – to search out new consumer segments that offer opportunities for growth. That is the HENRYs. But most important, these millennial HENRYs, age 23 to 38 this year, are the consumers who are on track to become the ultra-affluent ($250K +) of the future. They are better educated than their peers and employed in career paths that will lead to higher incomes as they mature. Luxury brands have traditionally aimed at the wealthiest and most affluent consumers. As a result, the lower-income mass-affluent HENRYs are often overlooked. Yet these are the next-generation customers that luxury brands must cultivate for their future. Luxury of Simplicity – Personal care and beauty brand Kiehl’s sells simplicity itself – simple product, simple ingredients, simple packaging – and extraordinary results. Its prominent “since 1851” heritage says a brand that has been around that long must be doing it right. Kiehl’s simplifies its packaging and presentation elegantly. Simplicity is hard to do, but beautiful to behold when it is achieved. “Less is more” becomes the guide to creating simple, elegant brands and brand stories. Anti-Status Luxury – As a brand, Jeep defines its promise as “Vehicles enabling life’s extraordinary journeys.” It explains its goal to: “Provide vehicles that support a lifestyle of boundless freedom, responsible adventure, and are reliable, safe, fun and environmentally friendly.” Jeep is an experiential brand that most especially promises to take its owners outdoors, as well as to the grocery store or mall. Through the many examples of how innovative break-through brands are tapping into these values in response to this new generation’s thirst for luxury products and experiences, this road map to the future of the luxury market will leave you with SIX transformative approaches to brand positioning that will help create a brand experience that HENRYs love. Review copies available to media.